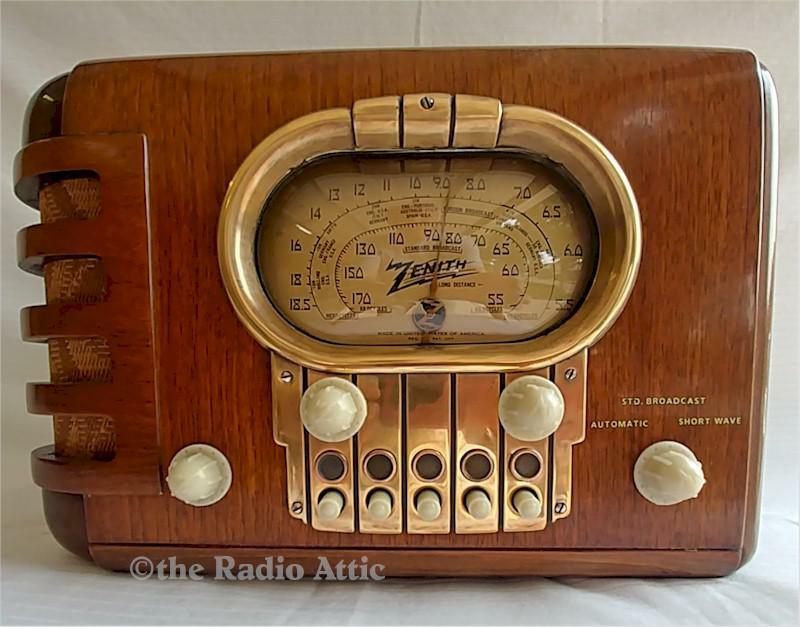 You are looking at another fully restored Zenith radio by Joe's Radio Shop. These "Racetrack Dial" Zeniths are rare and hard to come by and this is our first 5-S-319 in 25 years of vintage radio restoration. Blake has professionally restored the chassis by replacing the wax/paper capacitors with the new Mylar caps of equal values. The tubes and resistors have been checked and replaced as needed and Blake has added a fuse for safety. A cable was installed to plug and play your own device. This five-tube, two-band (SB,SW) was given a precision alignment for years of listening pleasure. Gary has refinished the cabinet with the proper grain filler, toners and lacquer for a factory fresh finish. Even the back, bottom and the inside of the cabinet are finished because the team at Joe's believes a radio should look as good in the back as it does in the front. 13"W x 8"H x 7-1/2"D.
You are visitor number 792 to this page.